Ruskin decorations - ¾" (19 mm) diameter. These were made for use as decoration on furniture or objects d'art. Edward Richard Taylor was the Principal at the Birmingham School of Art, where his son William Howson Taylor, was a pupil. In 1898 he founded the Ruskin Pottery, named for the artist John Ruskin, at Smethwick, near Birmingham, for his son to run. 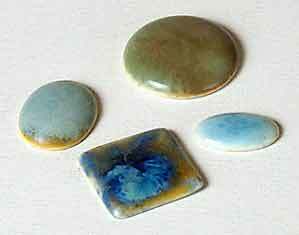 The company experimented with glazes, producing results that were quite different from anything seen before. The recipes for the glazes were kept secret, and when William Howson Taylor died in 1935, went with him to the grave. It is said, although this might be apocryphal, that he put a curse on anyone using the name 'Ruskin' for pottery. The pottery won many prizes, world wide, most notably at the St Louis Centennial Exhibition of 1904. The speckled, mottled, lustre and flambé glazes are certainly a mystery to those who try to copy them, and Ruskin pieces are most highly prized by collectors.